Knotty network could have powered universe’s early growth spurt. 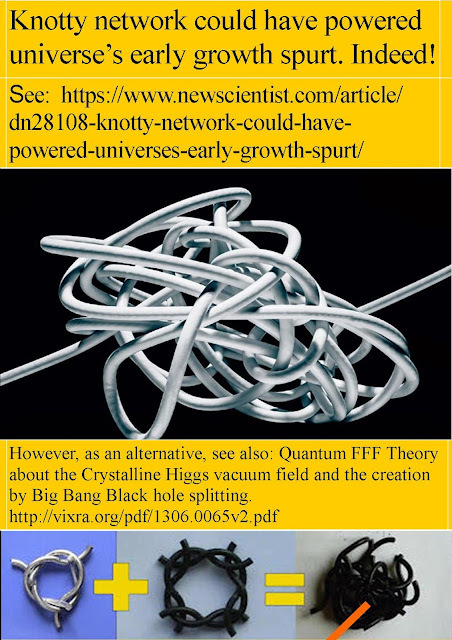 Knotty network could have powered universe’s early growth spurt, indeed also according to Quantum FFF Theory. However as an alternative, see also: Quantum FFF Theory about the Crystalline Higgs vacuum field and the creation by Big Bang Black hole splitting. 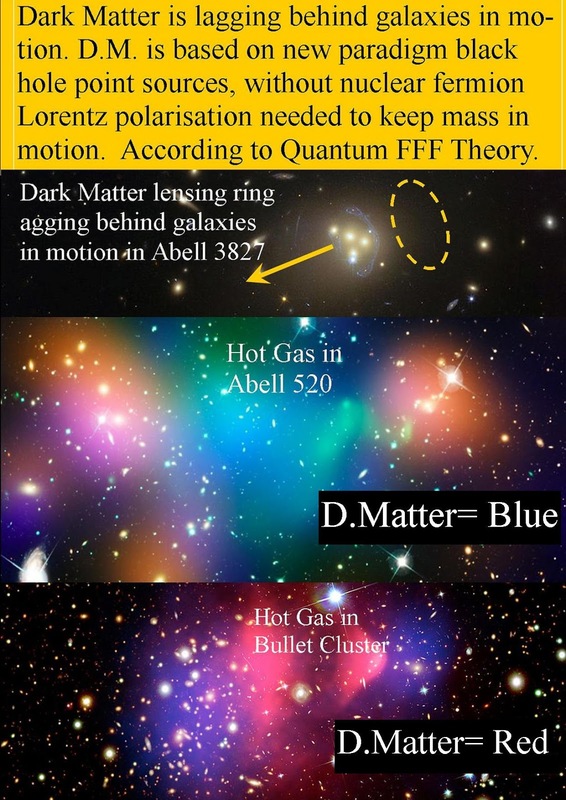 The dark matter mystery of colliding galaxies solved by Q-FFF theory. The dark matter halo distribution around each colliding galaxy clearly lags behind the normal matter distribution of the galaxy!!! 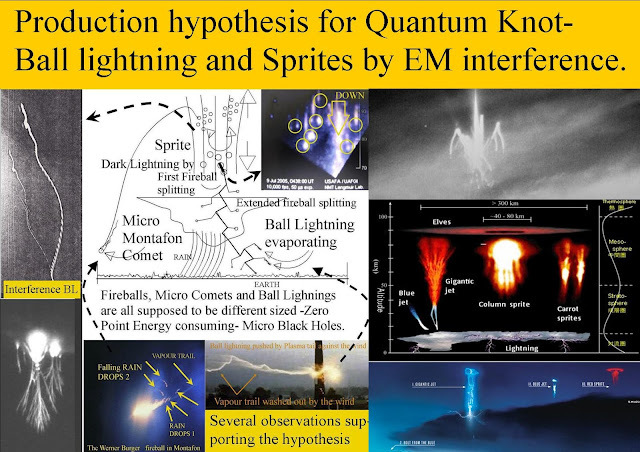 Quantum FFF Theory is able to explain this effect, by the Lorentz polarization differences between normal and dark matter! 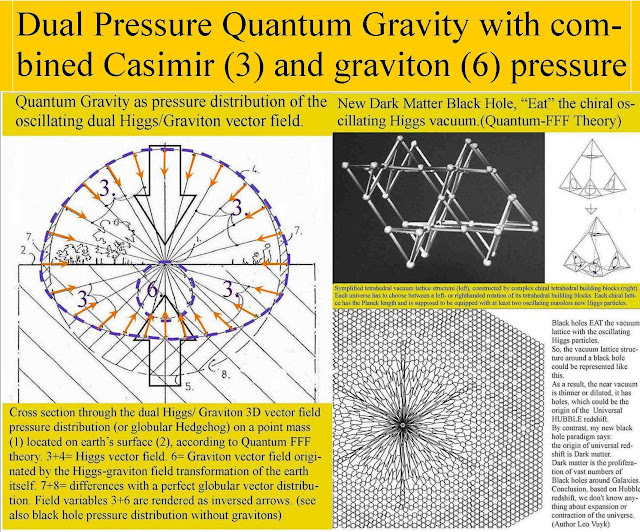 Dark matter is - in contrast with normal atomic matter-, assumed to be composed out of rigid complex quantum knots without spin polarisation and Lorentz polarisation. As a consequence dark matter quantum knots are not pushed by the oscillating energetic vacuum lattice into the polarisation direction. 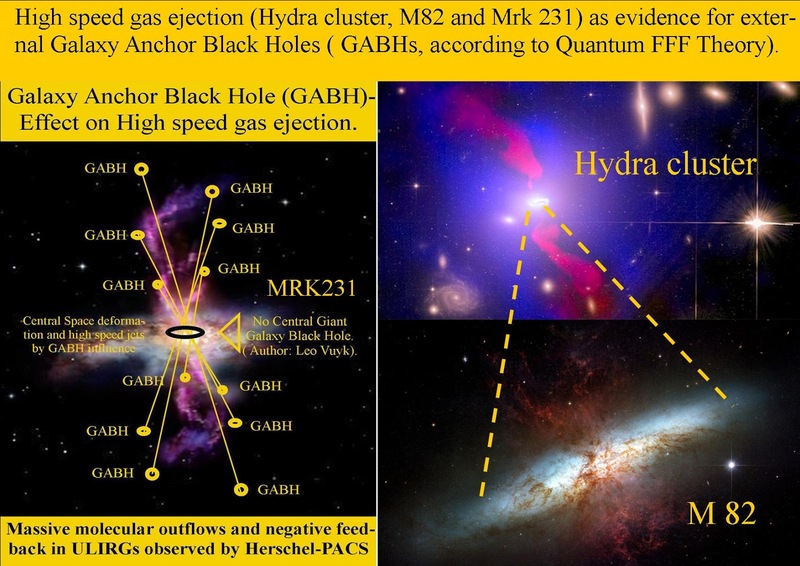 High speed gas ejection (Hydra cluster, M82 and Mrk 231) as evidence for external Galaxy Anchor Black Holes ( GABHs, according to Quantum FFF Theory). 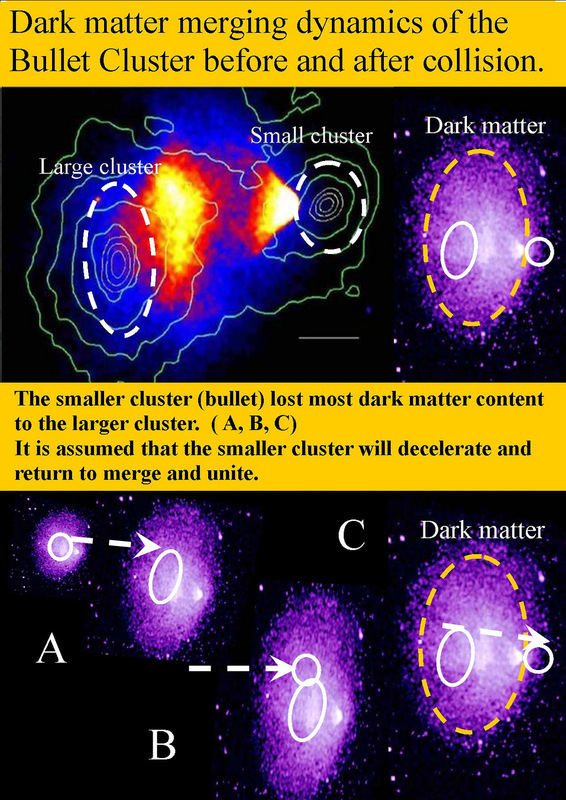 The unique large scale ejection of the Hydra cluster is evidence for GABH hierarchy (GABH splitting black hole scale differences) in the early universe. 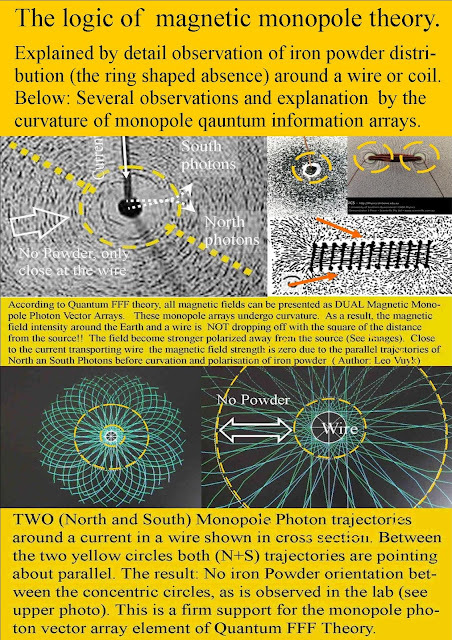 The Logic of Magnetic Photon Monopole theory. 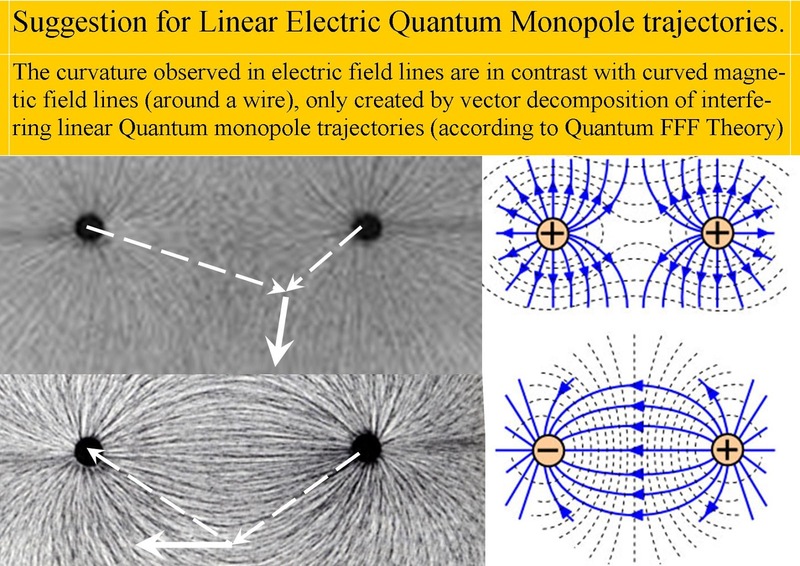 Suggestion for Curved Magnetic Quantum Monopole Trajectories. 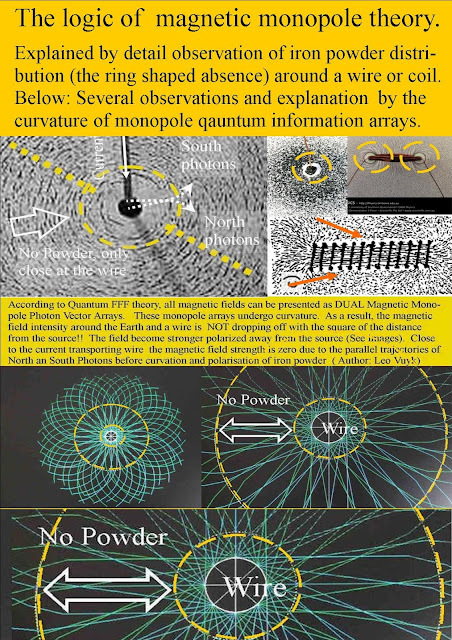 The origin of ring shaped absence of iron powder observed around all electric wires. 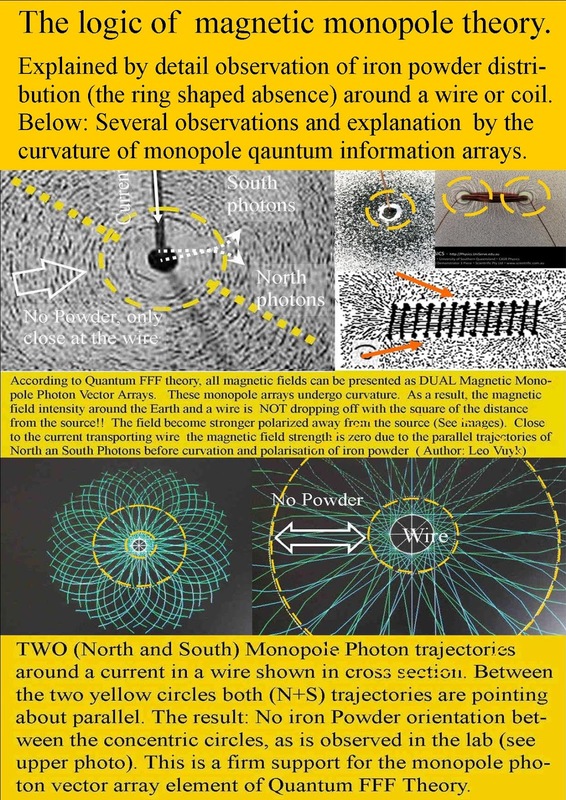 The logic of magnetic monopole theory. 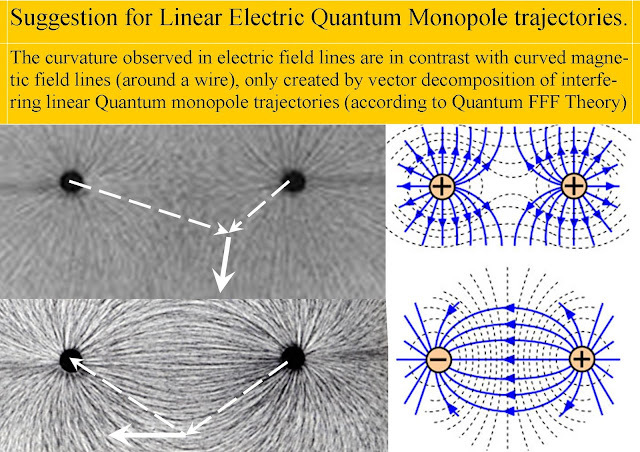 Suggestion for Linear Electric Quantum Monopole trajectories. 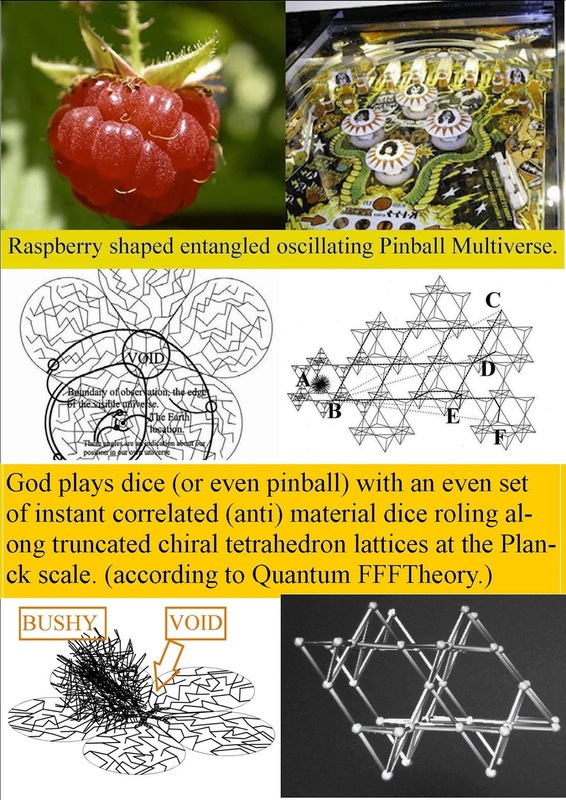 God plays dice (or even pinball) with an even set of instant correlated (anti) material dice roling along truncated chiral tetrahedron lattices at the Planck scale. Binary black holes of equal size, are assumed to form always Herbig Haro systems. Binary black holes of equal size, are assumed to form always Herbig Haro hotspots, even in the early universe, where they created massive stars in between as the progenitors of massive Galaxies and clusters (according to Quantum FFF theory). 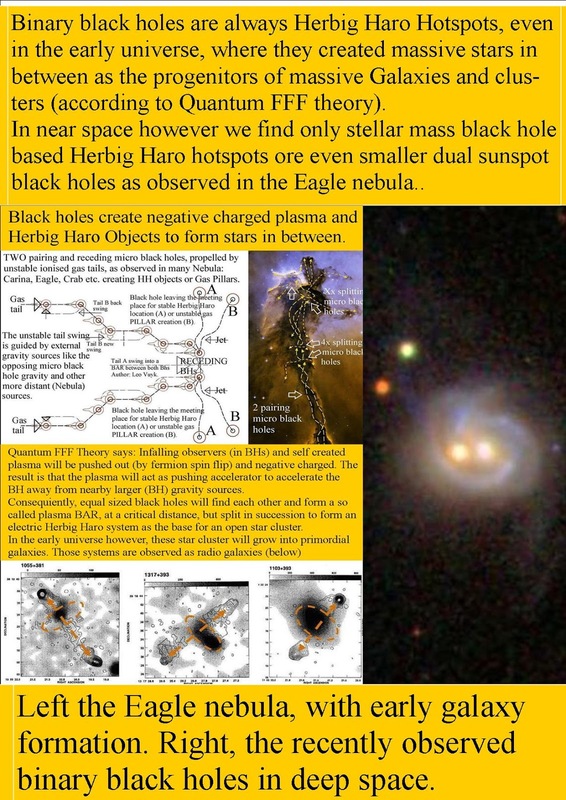 In near space however we find only stellar mass black hole based Herbig Haro hotspots ore even smaller dual sunspot black holes as observed in the Eagle nebula..
Left the Eagle nebula, with early galaxy formation. Right, the recently observed binary black holes in deep space. Quantum FFF theory however, tell us that only different sizes BHs can collide with the splitting of the largest BH in two equal parts, wich are able to form hotspots of a Herbig Haro system as the base for star and galaxy formation. 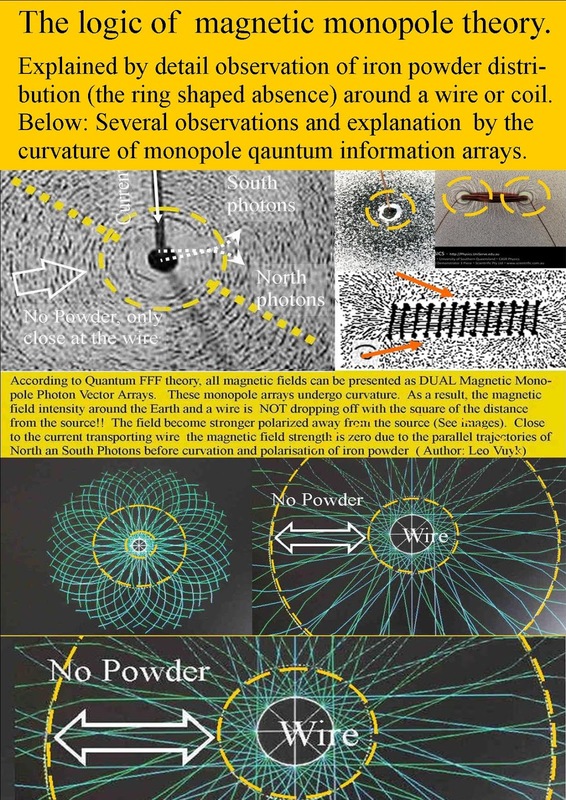 Even the smallest interference black holes like sunspots and Cometary nuclei are supposed to form sets of twns with h2 O creation in between out of the vacuum itself by pair e-and e+ forming..